In ten minutes, you can teach your spreadsheet some new tricks, even if you’ve never written a line of code. We’ll use Google Spreadsheet and Twilio Phone Number Lookup API to validate, clean up and format phone numbers easily. Tell if phone number a cellphone or landline. If you don’t have a Twilio account, sign up here. A free trial account gives you $20 in Twilio credit to play with. At $0.005 per lookup, you can look up 4,000 phone numbers before upgrading your account. Once you’re signed-in, go to your dashboard and click Show API Credentials. Keep your credentials handy — we’ll be pasting them into our code in a minute. Phone Number – this is the column you fill out. Status – is the phone number is real (found), or fake (not found)? Phone Type – is this a cell phone number? Can it receive SMS? 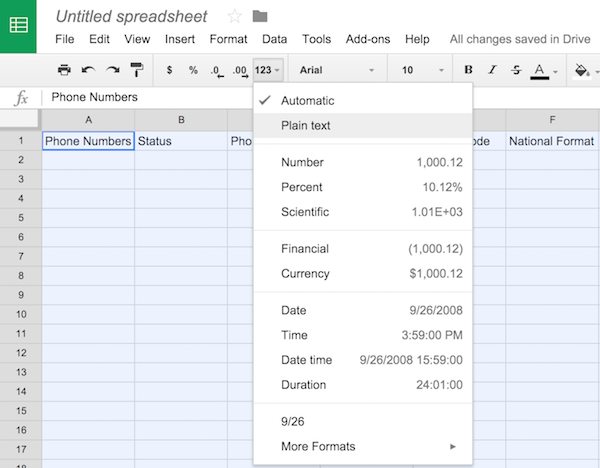 (if this is interesting to you, check out this tutorial on sending SMS with Google Spreadsheets). Carrier – Which mobile or landline carrier operates this phone? Country Code – Is this an international phone number? If so, what country it from? National Format – What is the proper formatting of this phone number? Select all of the cells in your spreadsheet and format them as “Plain Text”. Add a few phone numbers you want to look up. You can enter these numbers in pretty much any format you’d like. One of the powerful uses of the Lookup API is cleaning up a list of improperly formatted numbers. In the top menu bar, click Tools -> Script Editor to open the code editor. If you want to see how we arrived at that result, carry on. Write a lookup function to look up a single phone number. Write a lookupAll function to run lookup on every phone number in the spreadsheet. Replace that 3123131434 with your cellphone number. The job of lookup is to make an HTTP POST request to the Twilio Lookup API. You don’t need to know what that means to complete this tutorial, but you can think of it as submitting a “Lookup Phone Number” form with a single field of “Phone Number”. All the code in this step goes inside the lookup function. Define the URL for the phone number lookup API. Save your file and run your script. You’ll be prompted to authorize your app the first time you run it. Click View->Logs to see the data from the request. It’s not terribly practical to hard code phone numbers into our script. Let’s add a function to read the numbers from the spreadsheet, pass that data to lookup, then update our spreadsheet with what we discovered. Immediately above myFunction (and below lookup ), create the lookupAll function. The rest of the code goes here. Run your app again! You’ll need to reauthorize it since it’s now trying to access your spreadsheet as well. Google Sheets and Apps Script provide a surprising amount of functionality for a programming language that requires no installation or configuration. If you found this useful, you may want to check out our tutorial on how to send a text message from a Google Spreadsheet. With that, you could text the number that you just discovered is a cellphone. If you have any questions or come up with any cool use cases for looking up phone numbers, I’d love to hear about it. You can find me at gb@twilio.com or @greggyb.